Wondershare MobileGo is a mobile manager solution including tools and options for boosting, speeding up, and optimizing the performance of smartphones and tablets. Extra mobile management tools and features are also available by the application. MobileGo refers to two separate but closely related products which could help users better manage and optimize their mobile devices. First it refers to the app for Android which comes with optimization, media management, and device cleaning tools. In addition, more tools and options for Android tablets or smartphones are offered by the desktop version of the application. These include data transfer between phones, apps and media management, and device backup/restore. Content transfer – using one-click phone transfer, users are able to transfer video, music, photos, messages, calendars, contacts and more between various devices (operating on iOS, Android, and Symbian (Nokia)). And for those who want to do permanent deletion on their files on Android devices, this feature could be of great help, since after that the recovery is impossible. 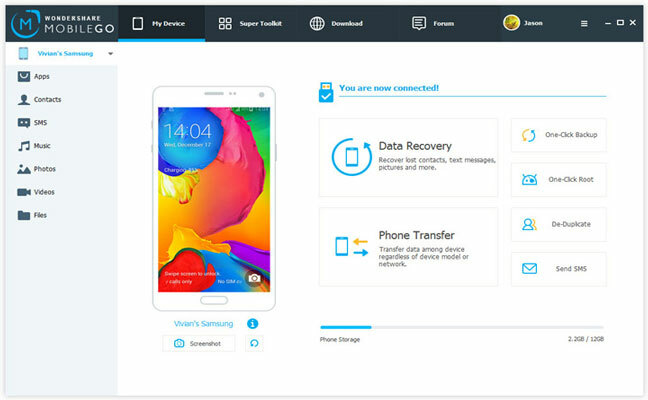 Android data recovery – in case of happening any data loss, whether it is call history, documents, videos, audio, contacts, images, or messages, Wondershare MobileGo could recover the data for users. Android device root – many people might have wanted to root their device for a long time, but because of the security or complexity issues haven’t done so. As a great news for them, this app could enable them to root their smartphone or tablet in just one simple click. Backup/restore – this feature is very important for everyone worried about losing the important information and data on their phone. Fortunately this option is compatible for both Android devices and iOS phones and tablets (such as iPhone and iPad). Photos, video and music files, call logs, calendars, text messages, contacts, and app data could be backed up and restored. iOS space saver – for users who want to have more storage space on their iDevice, this app could free up some space by various means and methods like compressing photos (without quality loss), cleaning junk files, and uninstalling unusable apps. Media management – MobileGo provides users with great tools for managing photos, music and videos on their iOS or Android devices. For instance, unwanted images deletion is available in batches. That is especially useful in situations needing more storage space on the device. Users could also select their ringtones from their favorite songs, or import iTunes music playlists. Screenshot capture – simply an option for taking a picture of what is viewable on the screen of the Android tablet or smartphone. The desktop version of the software is available to download and install for Windows running systems. It is compatible with Windows XP, Vista, 7, 8, and Windows 10. Unfortunately there is no MobileGo for Mac edition currently. That’s the case for other operating systems as well. So to buy the Windows application users have 2 license options: lifetime subscription or 1-year license. Choosing 1-year option costs $24.95 whereas the lifetime option has a price tag of $29.95. Please note that mentioned prices are just for using with one PC. MobileGo app for Android could also be downloaded freely from Google Play.